In 1922 Buster Keaton filmed what was probably the first chase scene to use San Francisco locations, if you don’t count Charlie Chaplin’s drive along the Great Highway in his 1915 short film ‘Jitney Elopement’. Chase scenes would later be a highlight in many movies set in San Francisco such as ‘Impact’ from 1949, ‘What’s Up, Doc?’ in 1972, and, of course, ‘Bullitt’ from 1968. In ‘Daydreams’, Buster goes to San Francisco to find a job so that he can marry the girl he loves and because of his clumsiness gets into trouble with San Francisco police who chase him from North Beach to Fisherman’s Wharf to the south of Market Street. The movie is available on DVD, but the clearest images that I’ve seen of the film are on the website Film in America. To be fair, filminamerica.com also identifies the locations from John Bengston’s book ‘Silent Echoes’ which saved me a lot of detective work. The chase starts out with Buster running east on Lombard Street and turning north onto Taylor Street. The “Crookedest Street in the World”, seen in the far back of my picture opened the same year as ‘Daydreams’ but had not been completed yet when this scene was filmed. 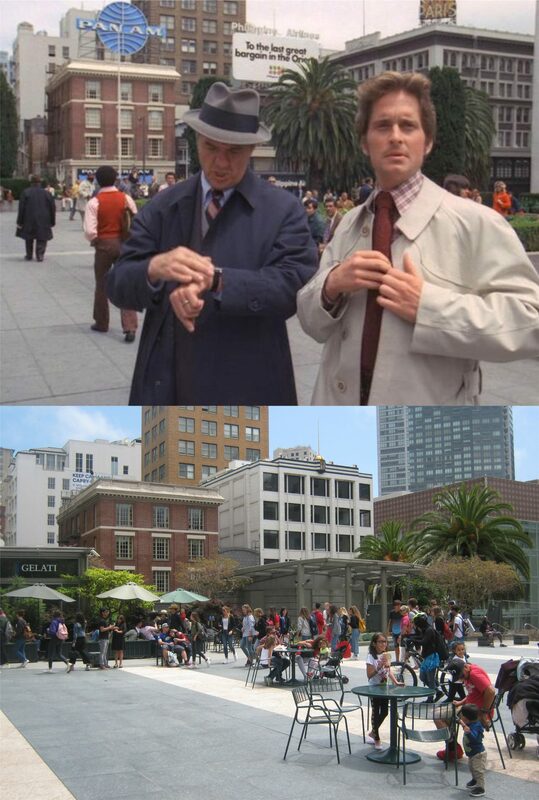 With the same film continuity as ‘Bullitt’, the next scene has Buster turning onto Lombard from Mason Street, running west to Columbus Avenue and hopping onto a north bound cable car. Now, that’s how you catch a cable car! This scene is of particular interest to me; it’s at the cable car turn around at Bay and Taylor Streets looking east on Bay. The cable car turntable, in the middle of the intersection then, was eventually moved farther south on Taylor to avoid traffic. You can see a cable car turning around at the far right in my photo. Buster is unaware that the cable car has turned around and is heading back south toward the pursuing police. The cable car turns south onto Powell Street from Washington Street putting Buster right back among the police who are about eleven blocks further south now from where we last saw them! Notice how many buildings in the background remain today. The Rex Apartments building is at the far left, and the green building was put in next to it where the billboard was in the film scene. The building with the fire escape, the one with the double row of arched windows next to it, and the small building are behind the northbound cable car. The building with three rows of arched windows on the northeast corner of Washington and Powell is the brown one with the Chinese lettering. Buster jumps off onto Columbus Ave. at Lombard Street and heads south on Columbus followed by the police. The chase scene moves to the south of Market Street at the intersection of 2nd Street and Minna Alley. As Keaton approaches the corner from the south, a streetcar filled with policemen pulls up and the cops chase him west along Minna Street. Fifty four years later, this intersection can be viewed from the opposite angle in the liquor store hold up scene in the 1976 film ‘The Enforcer’ starring Clint Eastwood. The last San Francisco location scene in the movie has Buster running west on Minna Street and turning south onto New Montgomery followed by the police.